New Zealand roots reggae ambassadors Katchafire have announced a run of club shows around their festival slots on One Love in California and Arizona Roots Festival. 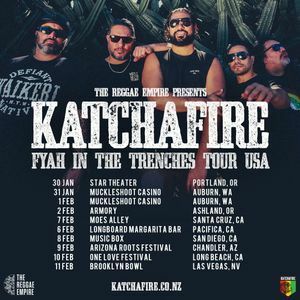 “Fyah In The Trenches” will be the 5th video/single from Katchafire’s acclaimed 5th studio album (released June 2018). Tickets for club shows go on sale this week – Links & details available at Katchafire website & social pages.